“Three Women Pose”. Click the image to see it larger. Studio instructors at the Delaware Art Museum including me, Danny Schweers, had work on display in the exhibit “The Art of Teaching”. The exhibit ran March 24 thru April 13, 2016 in the Gilliam Studio Library of the Delaware Art Museum. 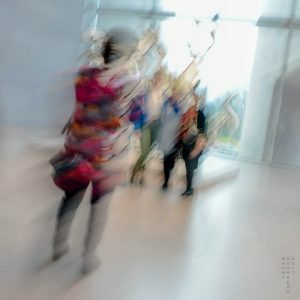 “Three Women Pose by Danny N. Schweers, 2017” was taken at National Gallery of Art of typical tourist behavior, three people posing while a fourth takes a photograph. Not typical was my shutter open for one-third of a second, me shooting from the hip, the camera moving and shaking. Click the image to see it larger. The original print sold while on display at this exhibit, but I am still offering other copies. If you are interested in purchasing an archival print, please contact me. I used this image in Photo Prayer 2017-01.